Scrapcosy 18 Eclectica stamp set for PaperArtsy - Stampers Grove is a webshop and mobile craft shop. In 2018 Raquel curated a series of vintage inspired tea-time stamps. A hint of floral and textile accents add to this feminine collection of stamps and coordinating stencils. In 2019, she added to this with some coordinating text and floral imagery specifically designed to tie in with the tea, floral, sewing, postage elements of earlier sets. 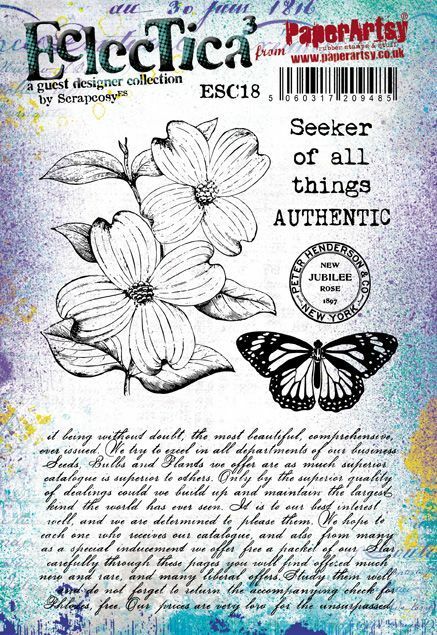 All the stamps and stencils tie in together perfectly for tags, canvas?art, journalling, cards and more. This series was released January 21st? 2019, check out the matching stencils to go with each stamp set too!